August is for skying at The Landscape Atelier! Our annual Skies class is well underway and this August we have lots of big summer skies to keep us occupied. As we launch this blog our next few posts will touch on just a few of the things we are learning about drawing and painting skies. As many of my students know, John Constable, the great 19th century English landscape painter, is a major source of inspiration to me. 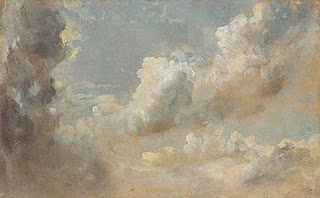 Constable was an innovator in the art of landscape in a number of ways, including his study of skies. He was one of the first artists to make plein air sketching part of his regular working process. During the summer months, he would leave his studio in London and roam the Suffolk countryside. He had a particular interest in skies and today his on the spot sketches (annotated on the back with date, time and weather conditions) are among his most compelling works. He used these sketches to make further studies in the studio and in the development of his larger studio works, including the famous “six footers”. 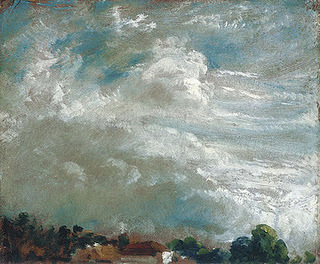 For those of you who might want to know more about Constable and his skying, I highly recommend the book Constable’s Clouds-Paintings and Cloud Studies by John Constable, published by the National Galleries of Scotland. 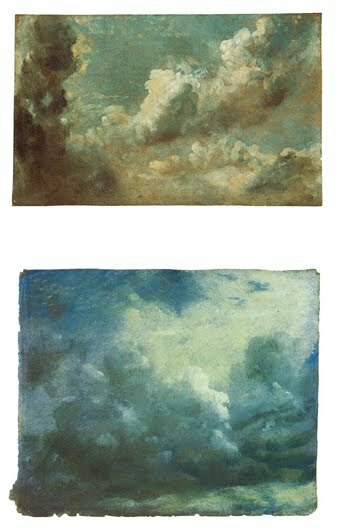 For those who would like to know more about Constable’s use of these studies and general process in creating the six footers, Constable: The Great Landscapes, published by Tate Galleries, is a great resource.